A non-normal return distribution (one that is asymmetric, not symmetrical) is a distribution of market performance data that doesn’t fit into the bell curve. The graph below shows the non-normal return distribution of the stock market. As you can see in the graph, the actual distribution doesn’t at all match the theoretical normal distribution. 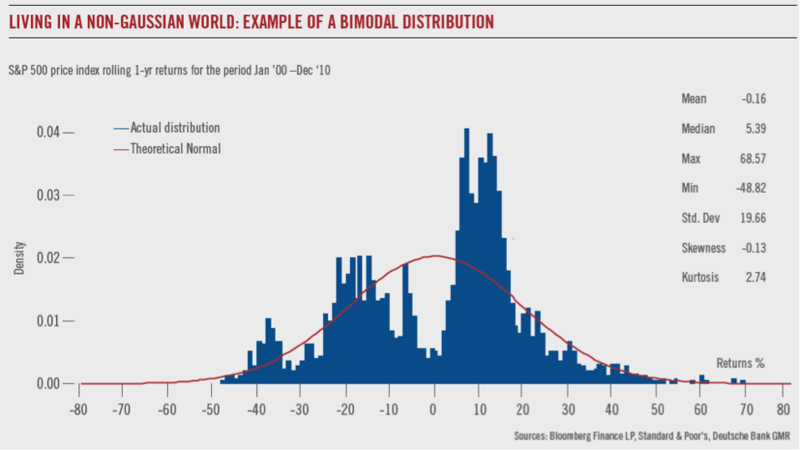 The red bell shared curve line is the “normal” distribution, while the blue bars are actual historical returns. Actual market returns do not present a normal “Gaussian” distribution that fits into a bell curve, so trying to measure such data with a linear equation that assumes a normal distribution is kind of like hunting for bear with a fishing rod. You may catch your bear, but you may get a surprise if you expect to defend against a bear with a silly little rod. Most methods of portfolio management and asset allocation such as “Modern Portfolio Theory” and “Value at Risk” assume that market returns are a normal distribution. So, the magnitude of frequency of large losses (the blue bars to the left of the chart) occur more than they expect. You can probably see why they are surprised by the size of their losses. A more robust strategy for risk management realizes return distributions area asymmetric, not a picture of symmetry, and is better prepared for larger and more frequent losses.